Anyone try using BMX cranks on their SS? Thread: Anyone try using BMX cranks on their SS? I am liking the prices for some used BMX gear around here where I live....anyone know if I can run standard 170mm BMX cranks? New ground for me for this type of question. it will work with a bmx euro bb. Im going to be running profiles on my new Standard 29er... All steel rigid frame that is coming custom through a local bmx company. Why not run steel bmx cranks? i am not 100% certain it will work, but Profile makes several spindle lengths and arm lengths. my only concern is that bmx freestyle bikes have abandoned the threaded "euro" bmx bottom bracket because the bearings are too weak when you mash them in between a threaded cup and a 19mm spindle, not to mention at 22mm spindle like the one on a Primo Powerbite crankset. those manufacturers have moved onto making Mid and Spanish bottom brackets the standard. 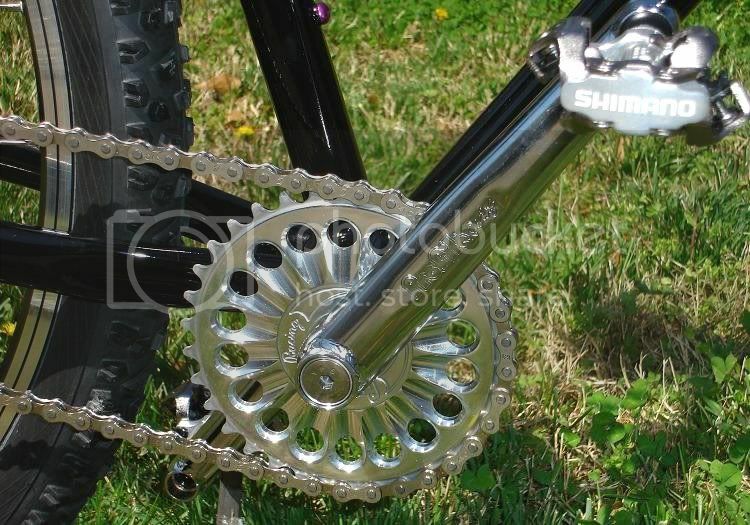 You should always use a 2 piece mountain bike SS crank with an external bottom bracket. You can convert a standard crank to SS as well, but I think the external BB is really the way to go. It's light and strong. oh yea it works, back when they used to sell Dotek cranks I bought a Sinz Euro square taper BB from Dans comp but im sure the Sinz cranks they sell now will work. check it out , they have the cranks selling for 50 bucks and there square taper BB's selling for 40 bucks, they are under the race tab. some will save not to use Bmx race stuff but its last just as long as conventional equipment. +1 for Profiles! I am a BMX rider at heart, so here is what I would do. They are available in many variations and Profiles have that legendary strength that you can rely on. Also, 187 bucks for a burly crankset is not too bad. You can even get the external BB like wjphilips was mentioning. I would love to answer more BMX questions! 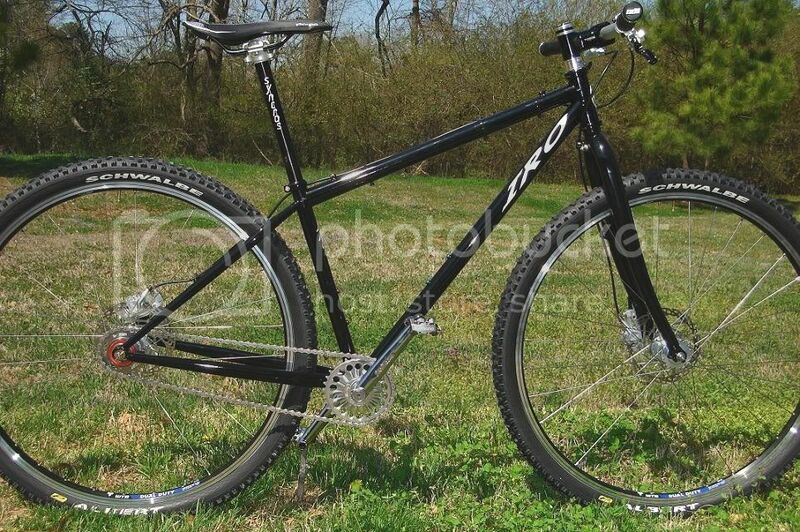 I used to run Profiles on my old XC back when I tried a coversion set up for SS. 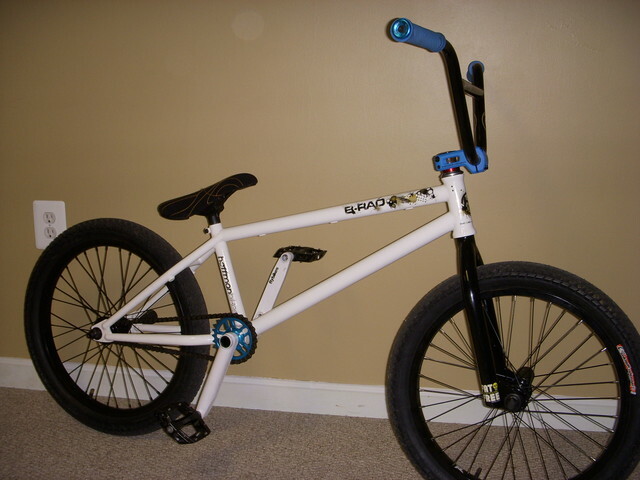 I thought about doing it again with my current set up as I had some Fly V3 cranks that were pretty much brand new. My problem was finding a euro bb that would fit a 22mm spindle. In the end I just sold them and picked up a used set of XTR cranks. Hell, I wanted to run a Profile Mini rear hub as well but run disc brakes. Thought it would have been cool as hell running a 25/9 set up or a 27/9. I guess I just wimped out and hopped on the weight weenie wagon instead. Would love to see some pics of your set up when done though! Exactly. I did think about that which is why I sort of ditched the project. I really did not want to have to try to figure out what I could get to work right. I think that once I couldn't run a Profile hub I pretty much just went a different route. I will say, it sure would be cool to see a full set up like that. I truly believe Profile cranks are the best/most versatile cranks made. I have a set on my BMX that have been going strong since 1998 (never even taken care of, actually! This is the pre-euro, massive, press in cup BB though). The same exact arms and BB's have worked well in both BMX racing and BMX street for so many people for so long. The only thing that has changed seems to be the options you can get with them...the design has not changed in probabaly 15-20+ years. I wanted to use them on my new SS build, but it got a bit expensive to have to buy a new spindle and bottom bracket for them only to have to remove the arms off my bmx. I'm still kinda debating ditching the XTR M952s I'll be using and doing profiles, but that may be later down the road now. A whole new crankset with external BBs and 4x104 bcd spider will run ~$250, which is not bad at all! Subtract $30 to run a BMX chainring instead of spidered. I'll trust Profile over Shimano XT any day for that price. Also, check out this Left Hand Drive disc bike! Good God that is a big photo! But yes! That would be a fun bike to have if I lived closer to some jumps! No doubt. This is what I tore apare/sold to build my current SS bike. What's up with the drive side disc tabs on those Easterns? Or are they not disc tabs? The bike is designed so that you can either be right or left hand drive. Alot of bmx guys will ride left hand drive if they use pegs and grind on the right side. This saves the chain/chainwheel from getting bange dup on stuff when grinding. 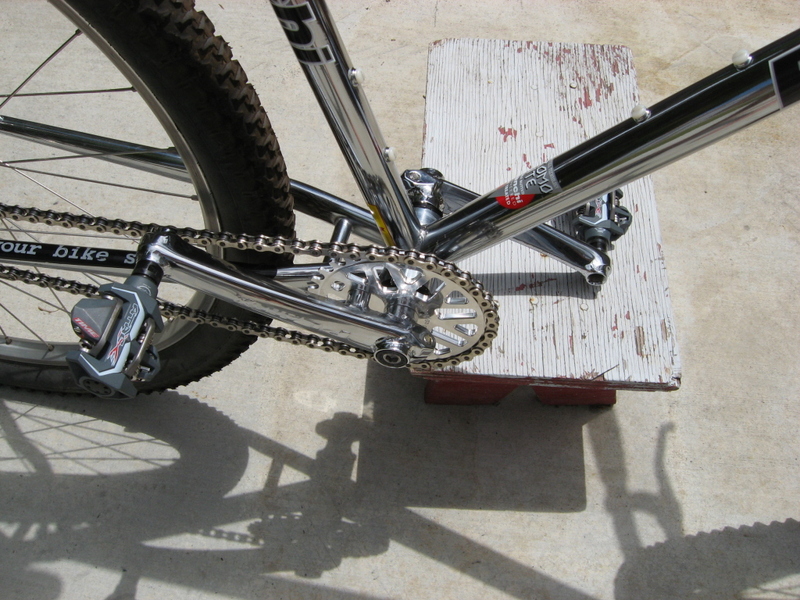 As you can see on my old bmx, the pegs are on the left side and the cranks/sprockets are on the right. This would be considered normal where as Left hand drive is sort of the new thing. I also ride and jump/bunny hop with my right foot back and left foot forward. This allows me to kick the rear end out towards the Left side of my body. So, I put my pegs on the left side and approach things i want to grind with them on my left. Guys that ride "goofie footed" or the opposite of me would set their bikes up as a mirrored image to mine. Not sure how the brake crosses over though. I mean, I think you would end up having more brake hanging out into the wheel area when you switched sides but I guess that depends on what brake you are running as well. I've been running Profile Racing cranks on my singlespeed for a couple of years, I love them. Super strong and come in long lengths (I ride 182s). They are kind of heavy, but I have the ti spindle which helps. A Standard 29er? You better post pics when it's done! ^^^genius! I would have never thought of pressing them into another set of cups! 182's! Man that is huge! Love it though! running profiles on my surly 1x1 only problem is my spindle is huge as the rear of these frames is ridiculous and can run silly fat tyres. If anyone else has run profiles on a 1x1 can you tell me what spindle length to use ? Ill for sure post pictures of the SBC 29er, it will probably be done in the next month or so. Hopefully. I mean its custom, is anything ever done on time? Brooklyn Machine Works sells their full suspension frames with the Profile Cranks too. Here's my SASS with Planet X cranks and euro BB. The original Redline BB exterior bearings died after 3 months. I R&R the BB with DK bearings (blue seal) which seem to be holding up better. One of the biggest problem I've had with any BMX bearings is they tend to be lower quality. I've emailed Enduro 2-3 times over the past couple of years to see if they make anything, either euro or spanish, but they have never responded. Anyways, I looked at my new Profile external BB and the spanish bearings are Enduro. I'm pretty sure with those bearings this is gonna be a killer setup. Over the years I've run Profile and Redline cranks on my SS bikes. I now run a set of Crupi Rhythm Pro's and love them. I'm in the process of building up a 1x1, and I really want to do the Profile Cranks. I loaded up my cart at the link provided by davesauvageau. Also, in the cart contents pasted below, is this an external bearing set-up? And what special tool(s) will I need to install this BB? Any help at all would be greatly appreciated. Sorry for the flood of questions, but I don't want to miss anything when I place my order and this is uncharted territory for me. The only things left that I need for this build are the BB, Cranks, and Chainring. Just want to be sure this stuff will fit on the 1x1. Thanks. Last edited by danthesoundman; 07-15-2010 at 03:56 PM. Since I have not gone this route myself I am not sure what bb you need. your best bet is to call Dans. The guys there really are on their game. They would be able to tell you what bb would work. As far as the chainring/wheel. The chainwheel only needs the one screw that goes through the sprocket and into the crank arm. Pretty straight forward. The one thing you may need to make sure you have is an adapter ring. Some chainwheels have different size bores in them. I am pretty sure that the Profiles use a 19mm spindle but I would double check with Dans (on the phone) to make sure the chainwheel you want is either drilled to that or comes with the adapter. If you need an adapter, they are less than $5 from them. Best bet is to call them on the phone. You can still go back and place the order over the web if you dont want to give them the cc number over the phone but it is well worth it to talk to them. Also, as a thumbs up for Dans, their shipping is outstanding. Depending on where you are, it should only take 2-3 days to get your crap! Very good guys! After reading that link, I had second thoughts. I guess that makes sense. 180mm. Jensons had a set of black ones in their Outlet Store, for $188.65! I just couldn't pass it up, and I like the idea of a stainless chainring. So disregard my previous post with all the questions. No worries, I get emails sent to me when there are updates on threads as many of you guys do. When this one came through it only showed your post about your cart at Dans. Glad you found something you like at a good price. I just got the Profile Racing Crankset in Chrome with a Pink 33t Imperial Chainring for the build I'm doing for my sis... Will post pictures when it's done! She's stoked! Glad everything worked out! Did you get my message back? thats what I call a BLINGle speed!! !